From 2009's Great South Side Sale. Photograph courtesy of Lehigh University's Community Service Office. Twelve years ago, professors John Smith and Kim Carrell-Smith noticed the vast number of usable items being discarded by students at the end of the year. They collected items put out for trash, and sold them in a sale that raised $500 for the local community. The Move Out Collection Drive now occurs annually as Lehigh students clean out their residence halls, donating materials they no longer need. 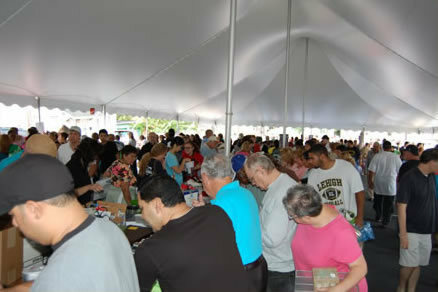 This year's Great South Side Sale raised $13,500 for the support of homework clubs in South Bethlehem. The sale combines the reuse of items normally tossed into the trash, with the support of the local community.